Australians have always loved to gamble so it's hardly surprising that Aussie bookmakers have released some of the most advanced mobile sports betting software on the planet. Punters in Australia can now wager on the AFL, NRL, cricket or horse racing from their Samsung Galaxy, iPhone or Microsoft Lumia. Sports bettors in Sydney, Melbourne, Perth and throughout Australia can now place bets, check the latest scores and watch AFL teams like the Western Bulldogs, St. Kilda and the Brisbane Lions play live on their Android and iOS smartphones and tablets. William Hill Aus comprises of SportingBet, Tom Waterhouse and Centrebet. Watch dozens of major sporting events for free on your iOS or Android. Dedicated app for the Australian market with strong focus on AFL, NRL etc. Live scoreboards, stats and real-time graphics make following a game easy. Get betting tips and review a full form guide for all thoroughbred horse racing. William Hill Australia are the only bookie to live stream racing from NSW. Full coverage of all global sports, incl. English Premier League and NBA. Choose a telecom company in Australia just got a lot easier following the announcement by Telstra that they will be live stream every game from the NRL and AFL 2017 seasons for free to customers with Android and iOS devices. ​Australia is one of the countries with highest percentage of the adult population engaged in gambling. According to recent stats, about 80% of Aussies regularly engage in some kine of gaming. Under those circumstances, it is not surprising that a number of major internet sportsbooks have a dedicated Australian version for the local market. The likes of William Hill, Ladbrokes, and Unibet are paying Australia special attention. If you add local bookmakers such as Sportsbet, it seems Australians have a lot of different mobile options to choose from. Considering how many popular sports and leagues are there in Australia, this is great news. There are a number of local events covered, such as the Australian Rules Football League. It consists of 18 teams in total, with all the big cities like Sydney, Adelaide, and Melbourne having at least one club in the competition. Another popular sport is cricket where the national team is among the strongest in the world. Horse racing also gets lots of attention, with the Victorian Horse Races being the most watched in the country and is home to the world famous Melbourne Gold Cup and Summer Carnival. Other popular sports include golf, tennis, NRL rugby, basketball, swimming, and soccer. 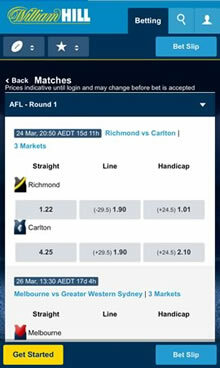 Australians can place mobile wagers on all of these betting markets easily from their iPhone, Android or Nokia Lumia. There are traditional money line and spread options, as also prop bets, outrights and many specials. ​Major international events also attract the interest of the Australian betting community. The most popular soccer leagues in the world like the English Premier League, the UEFA Champions League, the Spanish La Liga have their own set of fans. Add to that the most popular American competitions NFL, NBA, NHL, and MLB, that can’t compete with the local leagues it terms of attention, but are still beloved by many and offer many iOS and Android betting opportunities. The popularity of online betting in Australia means that online bookmakers make a special effort to develop the best possible bookmaker apps for devices like the Samsung Galaxy, Google Nexus, HTC 10 and the LG 5. Mobile betting has exploded in New South Wales, Queensland, Tasmania and the Northern Terrority. There are a number of applications to choose from and all kinds of devices are supported. You can bet on sports from iPad, iPhone, Android, Nokia, BlackBerry, and even Windows phone. The bookies have made sure sure to replicate all the features from their their websites. Most of the iOS and Android software is easy to use and offers complete betting experience when it comes to both managing your account and betting itself. Australians can place wagers on all of their beloved sports and leagues, both in-play and pre-match. The law is a bit strict when it comes to live bets, though, as they can be placed only via phone. However, the sportsbook apps found a way to make it much easier for their clients. Most of them simplified the procedure and users don’t have to actually talk to an operator. They can use the keypad of their device to place and confirm bets. The experience wouldn’t be full if there weren’t live stats and streams available. Fortunately, Australians can enjoy that too. Every mobile betting app out there offers in-play updates and some of them even provide live streaming. There are various sports covered, most notably Victorian Horse Races, NBA, many soccer leagues, cricket, and others. This way bettors from Australia can watch events unfold and place bets from their device all the time. Other important features of most of the mobile apps out there include Cash Out, banking, and plenty of information on forthcoming events. This makes Australia one of the countries that have access to the best mobile betting experience out there. Q: Is online gambling legal for Australian citizens? There is no law against betting online from Australia. Individuals are not forbidden to do so. Only gambling operators have some restrictions in terms of what they can offer and not. Simply put – it is safe to bet from Australia and no one will charge you. Q: What about taxes. Are Australians obliged to pay taxes? No, gambling winnings are not taxable. The government does not consider that a profession, so there is no need to declare or pay anything. In fact, any winnings from betting are considered to be a consequence of pure luck. Q: How can I deposit and withdraw money from online bookmakers from Australia? There are a number of ways to deposit and withdraw money from Australia. PayPal is not accepted, but similar e-wallets such as Skrill and Neteller are. You can also use POLi, credit cards, direct bank transfers, BPay, and others. Make sure to check if the method you are using is eligible for withdrawal since some of them are only eligible for depositing money. Q: What about Bitcoin. Is it accepted by some bookmakers? Traditional bookmakers do not offer Bitcoin payments and this is no exception when it comes to Australian customers. However, there are Bitcoin-based gambling operators that accept Australians, if this is your preferred method. Their offers aren’t as good as those of the biggest names in the industry, though. Q: Are customers from all Australian states accepted? Yes, all states are accepted and can register, deposit, and bet. There are some limitations in terms of promotions. Citizens of New South Wales, South Australia, Western Australia, and Victoria are not allowed to take advantage of deposit bonuses due to some local regulations. It’s not ideal, but there are no other restrictions.